Verken het regenwoud van Alaska met een gids die je meeneemt op een 3-uur durende wandeling met een rit van 15 minuten door Ketchikan. 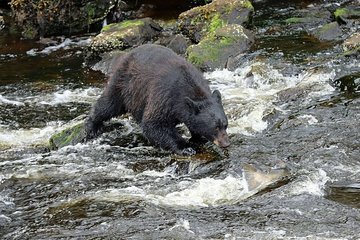 In het Tongass National Forest leer je over regenwoudplanten zoals Sitka vuren bomen en ceders en zoek je naar zalm, adelaars en beren. Je wandelt over een zacht glooiend terrein voor een totaal van ongeveer drie mijl met een groep die beperkt is tot 12 personen. Bevat drankjes, gids en retourtransport van Ketchikan. The tour guide was great and the sights were beautiful. The forest was amazing and the little bit of rain really brought everything to life. I enjoyed the walk through the forest and we got to see a lot of different and interesting things. The tour guide was constantly talking and teaching about what we were seeing which was great. She seemed extremely knowledgeable and I learned a ton. This tour is definitivly too expensive for what you get. We had a nearly 90 minute walk on wheelchair accessible roads and about 45 min of drive. The guide was friendly, but not very talkative. She knew about all the plants on our way. But thats it. Nearly 100 a person for such a tour is too expensive. I recommend to do another tour! Interesting hike but overpriced. Being from Florida the differences were captivating. Our tour guide was average except he took us to a stream where he had seen bear and after about 15-20 minutes the bear did come out from the trees awesome. Enjoyed the hike, but wish our guide was a bit more experienced. The only wildlife we saw were the deer in the parking lot. The hike had some hills, but was not strenuous. We had an excellent guide. She knew so much about the rainforest. It was a terrific experience. It was a great morning walk with Carol and two other guests. We walked comfortably for about 1 mile to a waterfall. Lots of vegetation along the way to hear about from Carol. Nice to be in the woods and to be on such a private tour. I recommend this trip. A very enjoyable experience. Excellent guide . While we could have walked the trails on our own we would have missed all of the important information including recognition of many species of plant life. Had a Wonderful Hike!!!! Just long enough and our guide Cat was GREAT!!! I think this tour was very nice and explanatory of the forest in Alaska. It was well planned and followed through. I enjoyed the tour guide as well. The scenery was just gorgeous. All nature-lovers would LOVE this. I do feel it is WAY over priced and should be in the region of $39-49/ per person.